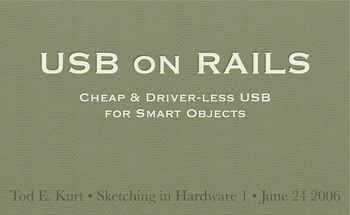 I gave a talk at the Sketching in Hardware 1 conference. It was a great conference, full of amazing people and hosted at an astounding location. I’ll write more on the conference later. However, if you want an platform for your HID approach, have you looked at the Atmel AT90USBKEY? This is a demo board produced by Atmel for their AT90USB1287 microcontroller which has built in USB slave (like Arduino implements) but also USB Host which opens up new apps and possibilities. Atmel supplies USB HID drives/code/examples for the device. Think about the potential of Arduino software (or its Wiring cousin) with the config library and hooks to talk directly to the AT90USBKEY for software download over USB. Way beyond my technical skill but I understand this to be viable under Arduino. Dethe Elza, the best embedded system I’m aware of for Mac OS X right now is Arduino. It can be powered and programmed via the Mac’s USB port and the programming environment is very similar to Processing, if you’re familiar with that. It’s a great system and I’ve been using it extensively. It’s much cheaper than PIC or Basic Stamp systems. I enjoyed the slides and am looking forward to trying it out. I have two questions, though. At first it looks like you’re saying that we can use USB HID without a lot of configuration, then the last slide shows a configuration window with no explanation of how to use it. Are there any tools for creating the HID configuration? Also, are there any embedded systems you can recommend to use from OS X? Like you I’ve been put of PIC programming because the tools are so Windows-centric. But even the tools I see which claim to support Macs seem to require a serial or parallel interface. I’ve got a serial converter for my Mac, but it’s a hack and seems flaky. Any recommendations for a USB-centric approach (or better: Ethernet-centric)? nap, that’s interesting and you’re totally right. I wonder why I kept mis-reading it? Was it “Human Input Device” to begin with? Or maybe I’ve been blinded by all the input-only HID devices out there. I really like the slides and I would love to hear the talk. Just one note, maybe you’ve heard it already. On slide 6 you write ‘”HID” is a misnomer.’ But from what I can tell, HID stands for Human Interface Device, so I don’t think there is an implied bias toward input in the name.